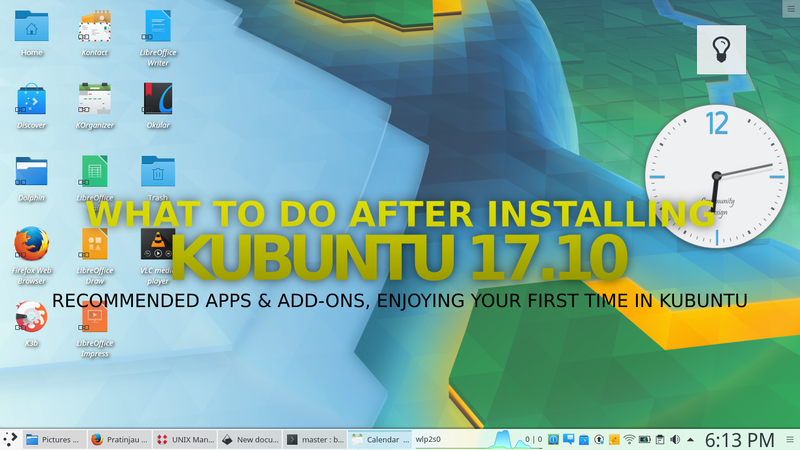 This article gives recommendations for beginners and first-timers to do after installing Kubuntu 17.10. 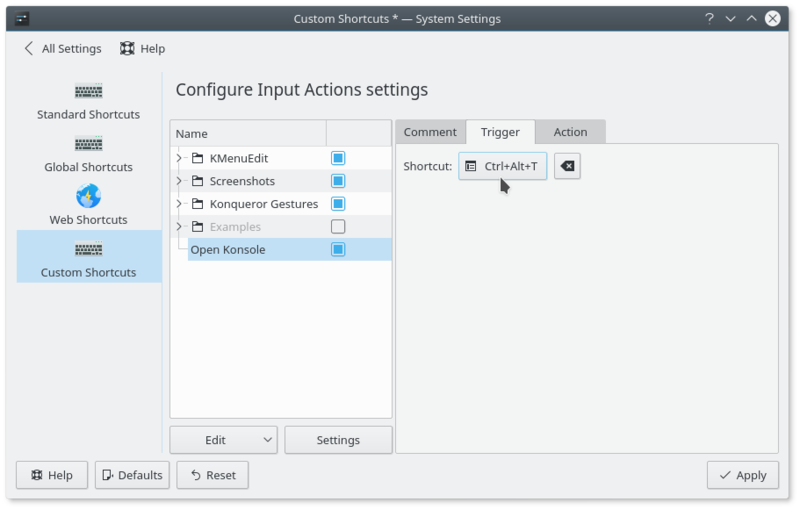 This including short introduction to Kubuntu built-in apps, recommended apps and browser add-ons, common shortcut keys, and where to get help/documentation from inside Kubuntu. 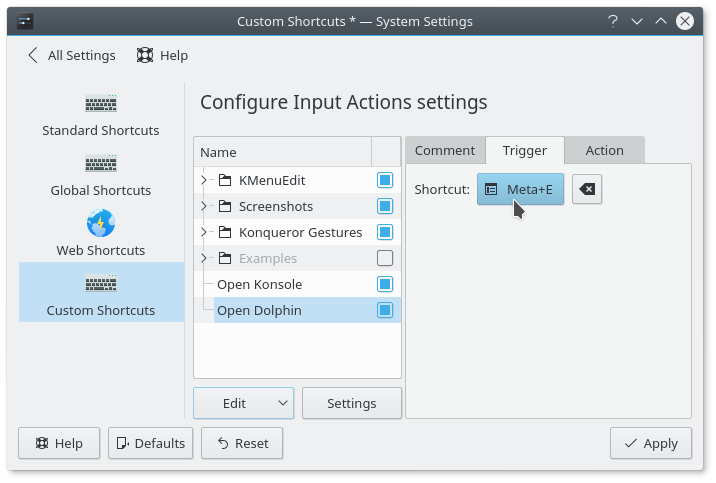 I hope this article helps anyone to get friendly and easy to use Kubuntu. Enjoy! 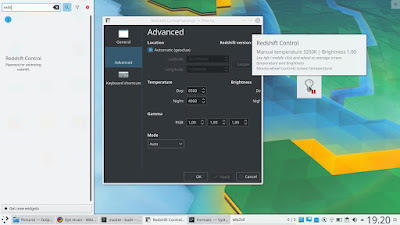 This article is about Kubuntu Artful Aardvark. 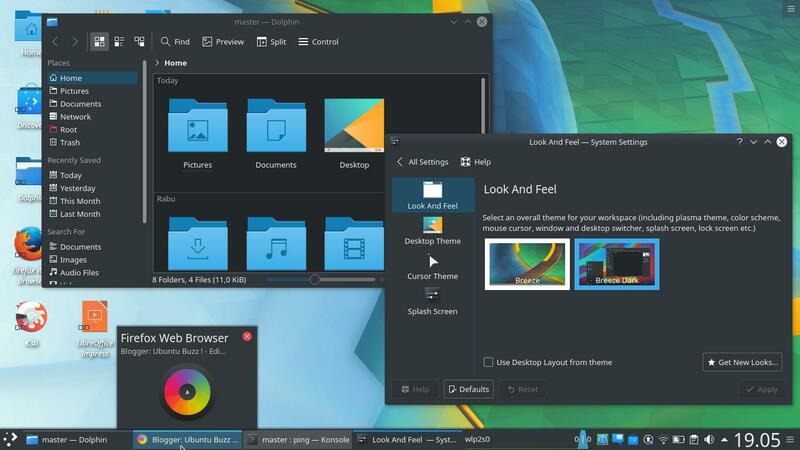 If you need something else, we have download links for Kubuntu + all Artful varians, how to install Kubuntu 17.10, writing Japanese Kanji/Hiragana in Kubuntu, and Latte Dock to decor Kubuntu. Kubuntu doesn't activate tap-to-click by default. To activate it: go to System Settings > Input Devices > Touchpad > make it blue "Mouse Click Emulation" > Apply. 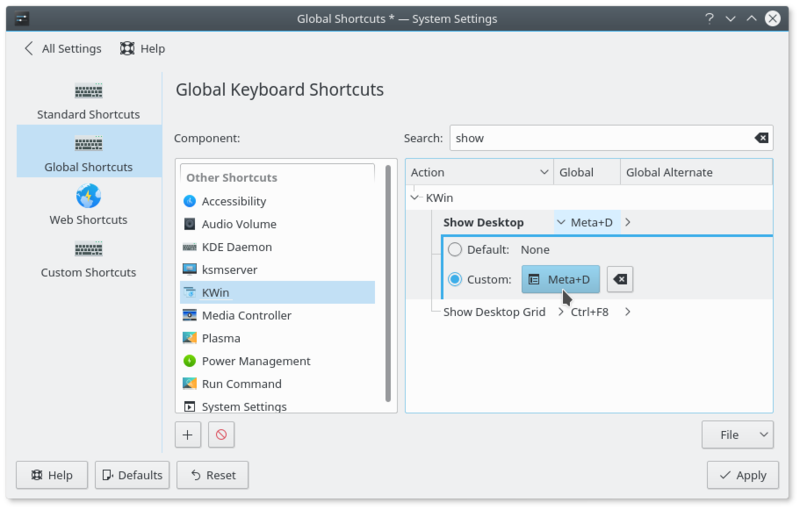 Just recognize that 'Win' key is called 'Meta' key in Kubuntu. Sometimes it's also called 'Super' key. To add new shortcuts: go to System Settings > Shortcuts > follow examples below. 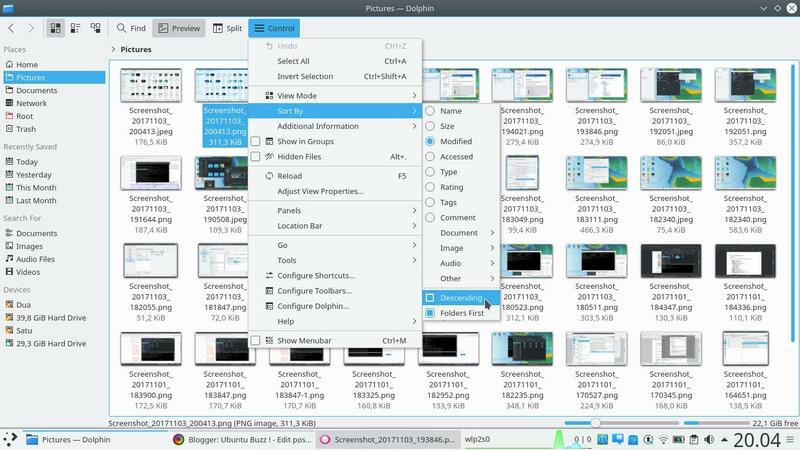 Win+E to open Dolphin File Manager. 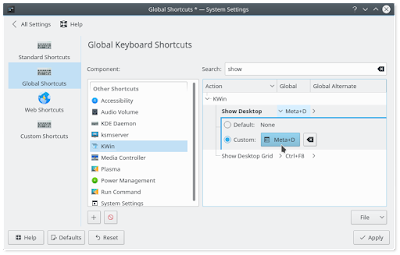 See Global Shortcut > KWin > edit the "Show Desktop" entry. Ctrl+Alt+T to run Konsole terminal. Just like in MS Windows and Apple macOS, you can put your favorite app icons on desktop. 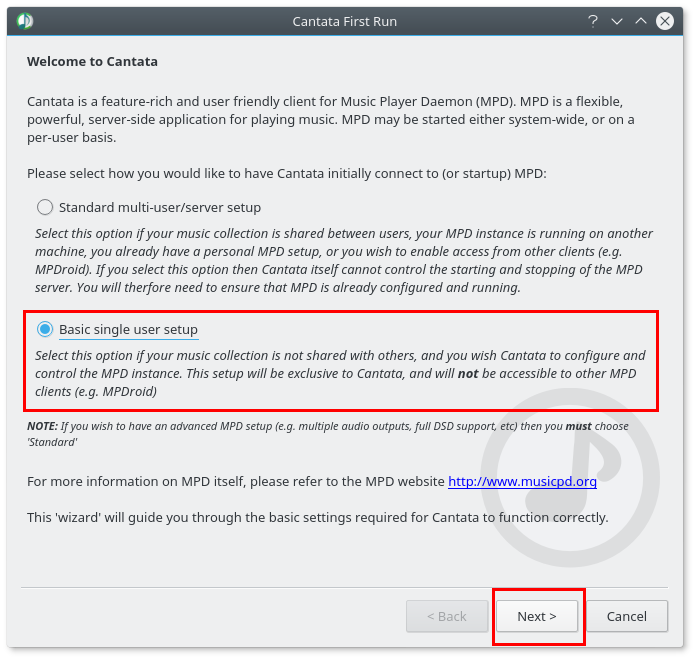 Go to menu > find one app > drag the icon > drop it on desktop > select "Link Here" > done! Go to Dolphin File Manager > press triple-line button > Sort By > Modification Date > Descending > done! This kind of sorting shows newest files at top and very efficient for most users. If you want to change language for time formats, as well as numeric and currency, go to System Settings > Regional Settings > Formats > change anything you want there. 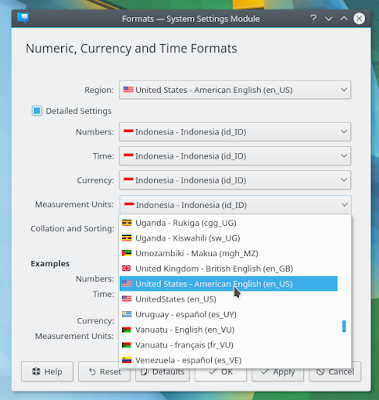 Changing the language of "measurement units"
KMail is the default email client in Kubuntu. 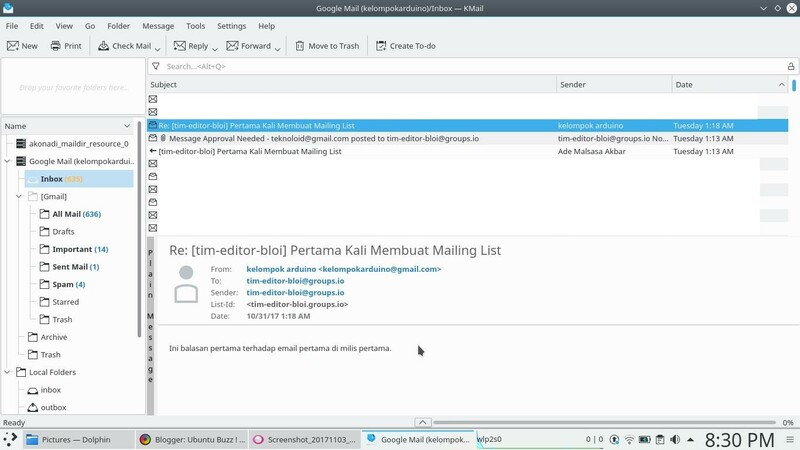 To setup it to read Gmail, we have KMail step-by-step tutorials for Gmail IMAP mode and Gmail POP3 mode. uBlock Origin: to block ads, efficient to memory. Disconnect: to block all trackers that are dangerous for you, save your bandwidth by cutting all unnecessary connections in every website. Search Link Fix: give you the real URL when right-clicking > Copy Link Location in Google Search. So you don't have to 'Open In New Tab' first each time. No trash URL anymore. HTTPS Everywhere: to force all connections to all websites and in all components in each of them to use HTTPS. So, if you visit CNN (the visible thing) your main connection to CNN will be secured using HTTPS and also every components inside CNN web (the invisible things) will also be secured. Image Block: simply block all images before being downloaded, save you bandwidth a lot. DownThemAll! 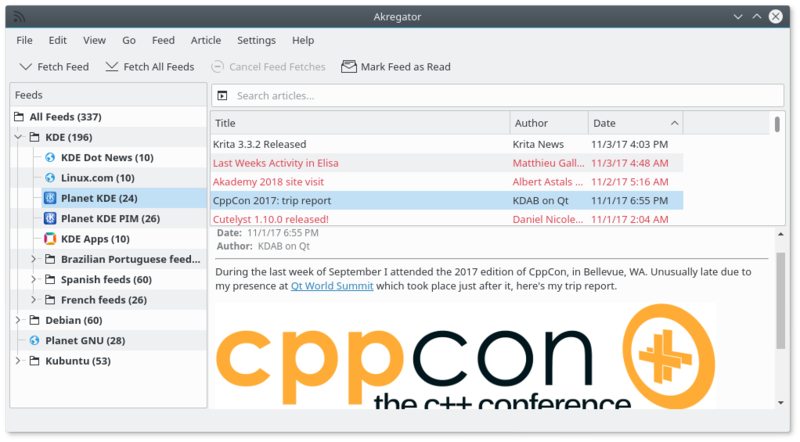 : a download manager with resume and acceleration features. 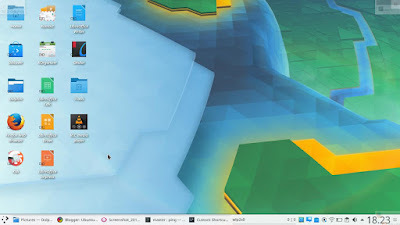 Synaptic: you can search for apps and games, install-remove-upgrade them with detailed info + progress bar so it's far more easier to troubleshoot later (Plasma Discover doesn't give you that). Emacs: the text editor that is super-multipurpose, you can use it to produce elegant documents (article, web pages, PDF ebook, PDF presentation) and also programming in any language. Persepolis Download Manager (PDM): to replace Internet Download Manager. I recommend you to integrate it with FlashGot add-on in Firefox. You can subscribe to UbuntuBuzz latest posts, also many other website's posts (e.g. news, podcast, tutorial, etc. ), by having the RSS feed address. We have a collection of a hundred RSS addresses of GNU/Linux websites here. 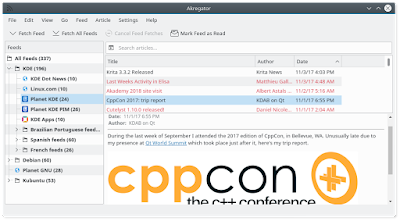 What you need to do is only copy a URL and paste it to Akregator. Then you are subscribed to the latest posts! We have the tutorials to sync KOrganizer with online calendar Fruux.com and Google Calendar. 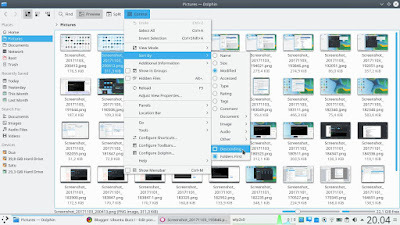 The online service is very useful when you have many OSes or computers so changing a schedule in one computer will change same schedule in all computers. 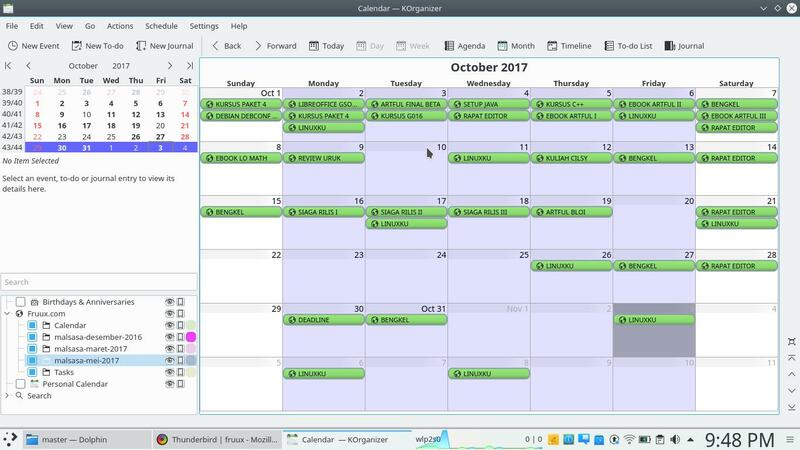 If you don't use online service, then offline scheduling is also supported by KOrganizer. 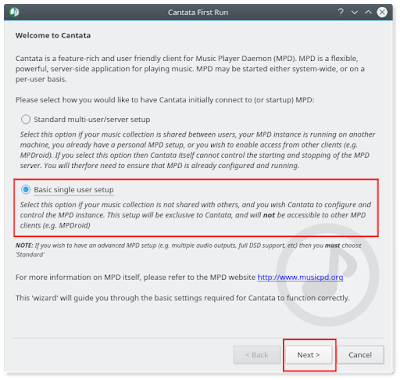 Personally, this is my favorite program that is very useful and I hope you'll find it useful too. 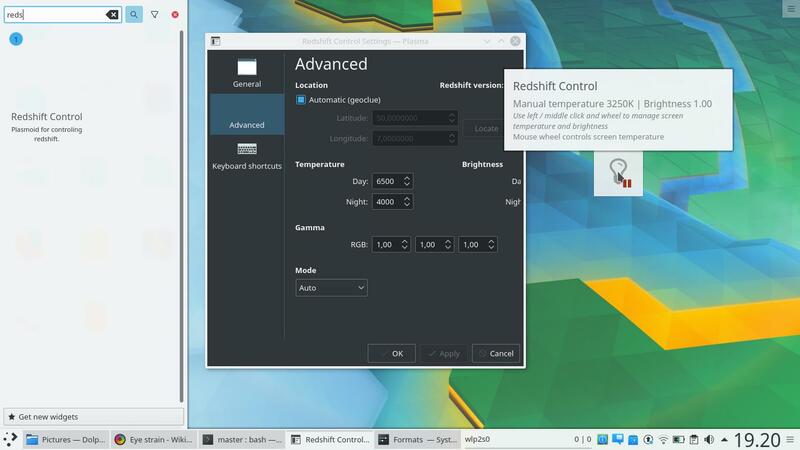 Go to System Settings > Workspace Theme > Look and Feel > choose "Breeze Dark" > Apply. Many users prefer dark theme (perhaps you too?) and you'll find it's beautiful in Kubuntu. Go to menu > type "help" > run Help. 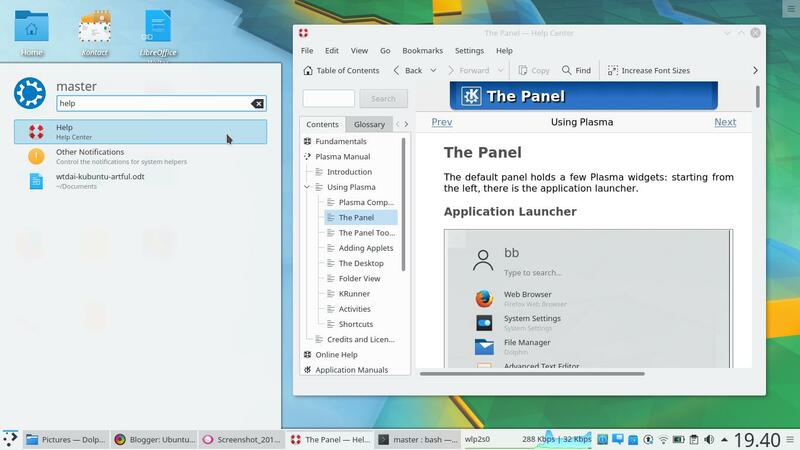 Here you can find everything you need to know in Kubuntu desktop. 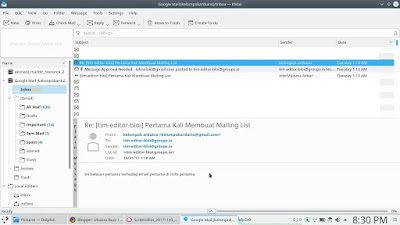 For example, you can read documentations about Dolphin, KMail, KTorrent, and another KDE Applications; you can also read manuals of command lines such as cp, ls, mv, etc. 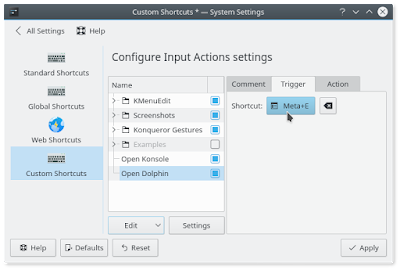 Here are some keys useful for daily life in Kubuntu. Show multifunction box. Find apps, run any app, calculate numbers, even convert currencies.